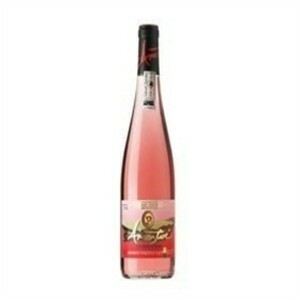 It’s going to be way over 100 degrees…Where’s my Txakoli Rose? Once upon a time I dated a Basque girl. She was stunningly pretty, with a great profile, awesome dark hair, and turned me on to her cuisine, BUT NOT TO THE WINE. Now, that could have been that it was harder to find a Basque wine than it was to win the lottery, but I remember going with her to a little Basque place near Carmel, with a myriad of strangely written wines on their menu, and we did not venture to try them. I think we had a buttery Chardonnay (and lightning almost struck us as we were leaving in a sudden rain burst, but the causality escaped me at the time). I didn’t get to explore those rare grapes until about 7 years ago (God, time is flying by). And, as we often say, the wines from the region complement the food! And I went nuts raving about the crisp zinginess of the dry white wines of Txakoli, and how I wanted a healthy slurp with every fried calamari salad I could find, or how I would love to share a bottle with a hunk of sausage, some olives, and a loaf of peasant bread, huddling at the beach while the sun set. One of my wine-geeky friends, who actually looked and sounded more like a Brooklyn bouncer, but was studying to be a master sommelier with some of LA’s finest wine minds, delighted in reciting to me all the grapes, such as the Hondarrabi Zuri and Hondarrabi Beltza that grow in the Txakoli region (pronounced “Chak-oh-lee) and its three sub regions: Getaria, Biscay and Alava. And recite he did, over and over, and spelling everything…but it sunk in, and boy, was I hooked. 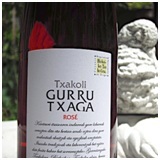 Now, imagine my excitement when I discovered that those fabulous wines of Txakoli also included slightly subtler acidity in magnificent and still very vervey and exciting rose versions! They are hard to find, but Gurru Txaga and Ameztoi are both imported, (Along with Gorrandone and others I couldn’t find) so ask your retailer who probably just sells their white to get you some. They should run about $20-$25. They both show you that raspberry, strawberry note found in Provence rose, with a great crispness, zing, and a good dose of minerality including sea salt. I found the Ameztoi a little wilder and quite briny, with a distinct lime note. A little like adding a splash of vichy water to a rose, along with a dry sauvignon zing. But the sum is much better than that , and is absolutely unique to the region. I found the Ameztoi was my favorite, but my friends seemed to prefer the slightly subtler Gurru Txaga, go figure . At any rate, while the white Txakoli is fabulous with seafood, particularly fried seafood, and fatty sausages or briny olives and pickles, the Rose pairs beautifully with most things off the BBQ. Carmelized chicken, browned meats, grilled veggies, and pizzas from the grill, make an insane treat. If you are feeling lazy, try a regular California Pizza Kitchen BBQ chicken pizza from your grocers freezer section, and pull it out of the oven to serve with a glass of Txakoli rose and a movie. Pretty darn good.